During the last week, Israeli forces conducted 77 incursions into Palestinian communities in the West Bank. At least 46 Palestinian civilians, including 8 children, were abducted in the West Bank. In the West Bank, on 09 February 2013, 3 Palestinian civilians, including a child, were wounded when some settlers moved into Azzoun village, east of Qalqiliam and threw stones at a number of houses. Palestinian villagers hurried to get the settlers out of the village, but the Israeli forces moved into it and fired rubber-coated metal bullets, sound bombs and tear gas canisters at the Palestinians. As a result, 3 persons were wounded. On 11 February 2013, journalist Amer Mohammed ‘Abdeen, 32, was hit by a tear gas canister to the right leg when the Israeli forces moved into al-Sa’ida area, southwest of Beit Awwa village, south of Hebron, to demolish civilian facilities. Following the demolition works, the Israeli forces attacked the Palestinians, who were in the area and fired tear gas canisters, sound bombs and rubber-coated metal bullets at them. As a result, the abovementioned journalist was wounded. In the same context, the Israeli forces continued to systematically use excessive force against peaceful protests organized by Palestinians and Israeli and international activists protesting against the annexation wall and settlement activities in the West Bank. As a result, 3 Palestinian civilians were wounded, including a child and a journalist who were wounded in Kofur Qaddoum protest, northeast of Qalqilia. The third one was wounded by 3 bullets to the back and left thigh in Budrus village, west of Ramallah and al-Bireh. The Israeli forces established dozens of checkpoints in the West Bank. At least 18 Palestinian civilians, including 11 children and a girl, were abducted at checkpoints. 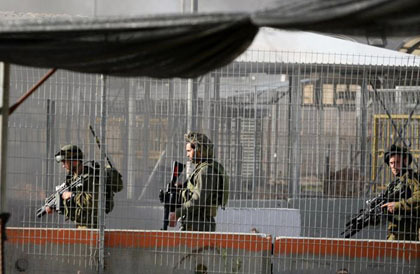 2 of these detainees were abducted at Beit Hanoun (Erez) crossing, north of the Gaza Strip. 6 children from the Gaza Strip were abducted when they attempted to cross the border into Israel. Israeli forces continued to attack Palestinian fishermen in the sea. The Israeli forces opened fire at the Palestinian fishing boats, but neither casualties nor material damages were reported. 4 fishermen, including 2 children, were abducted and then released after the confiscation of their boat. In the Gaza Strip, on 08 February 2013, the Israeli forces positioned at watchtowers along the border fence, north of Beit Lahia in the northern Gaza Strip, opened fire at some Palestinians who were few meters away from the abovementioned fence. On the same day, the Israeli forces positioned at watchtowers along the border fence, east of Abu Safiya area in the northern Gaza Strip, opened fire at some Palestinians who were few meters away from the abovementioned fence. Palestinian civilians were frightened, but neither casualties nor material damage were reported in both incidents. In the context of targeting Palestinian fishermen in the sea, on 10 February 2013, the Israeli gunboats abducted 4 Palestinian fishermen, including 2 children, who were on board a fishing boat belonging to Mohammed Abdul Razeq Sa’id Baker, 42. The fishing boat was 3 nautical miles of al-Sudaniya shore, north of Gaza City. The Israeli gunboats abducted and transported them to Ashdod seaport and then to Erez (Beit Hanoun) crossing to be questioned. The Israeli forces released them on the same day, but the boat remained in custody. On 11 February 2013, the Israeli gunboats stationed off al-Waha resort, northwest of Beit Lahia, opened fire at the Palestinian fishing boats. As a result, the fishermen were frightened and fled back to the shore for fear of being wounded or abducted. Neither casualties nor material damage were reported. During the reporting period, Israeli forces used force against peaceful demonstrations organized by Palestinian civilians and international and Israeli human rights defenders in protest at the construction of the wall and settlement activities in the West Bank. As a result, three Palestinian civilians, including a journalist and a child, were wounded. Following the Friday Prayer on 08 February 2013, dozens of Palestinian civilians and international and Israeli human rights defenders organized a peaceful demonstration in Bil’ein village, west of Ramallah, in protest to the construction of the annexation wall. The demonstrators gathered in the streets of the village, chanting slogans calling for national unity. The protesters aimed to stress the need to adhere to national principles and the right of return, to resist the occupation and to call for the release of all Palestinian prisoners. The protesters raised Palestinian flags and made their way towards the lands adjacent to the annexation wall. The Israeli forces closed all ways and entrances to the village since early morning hours, to prevent Palestinians, journalists and international activists from joining the protest. The protesters raised Palestinian flags and made their way towards the wall. They called through megaphones for Israeli settlers in “Mitityahu” settlement to leave Palestinian land. Israeli soldiers stationed in the area fired rubber-coated metal bullets, sound bombs and tear gas canisters at the demonstrators. As a result, dozens of demonstrators suffered from tear gas inhalation and others sustained bruises. Also following the Friday Prayer on 08 February 2013, dozens of Palestinian civilians and international and Israeli human rights defenders organized a peaceful demonstration in Ne’lin village, west of Ramallah, in protest at the construction of the annexation wall and settlement activities. The demonstrators moved towards areas of the annexation wall. Immediately, Israeli soldiers stationed in the area fired rubber-coated metal bullets, sound bombs and tear gas canisters at the demonstrators. As a result, dozens of demonstrators suffered from tear gas inhalation and others sustained bruises. Around the same time on Friday, 08 February 2013, dozens of Palestinian civilians and Israeli and international human rights defenders gathered in the Martyrs Square in Nabi Saleh village, northwest of Ramallah, to hold a weekly peaceful protest against the construction of the annexation wall and settlement activities, entitled: ‘Freedom for Our Heroes in Israeli Jails.’ The protesters walked towards the gate erected by Israeli forces near the entrance of the village, which leads to Palestinian lands that Israeli settlers from the nearby ‘Halmish’ settlement are trying to seize. Israeli soldiers fired live and rubber-coated bullets, sound bombs and tear gas canisters at the protesters. As a result, dozens of demonstrators suffered from tear gas inhalation and others sustained bruises. At the same time on Friday, dozens of Palestinian civilians and international human rights defenders gathered in Budrus village, west of Ramallah and al-Bireh, for a peaceful protest against the annexation wall and settlement activity. The demonstration was entitled: ‘In memory of the Killing of Samir Amed Awad.’ The demonstrators walked through the village streets and headed towards the wall. The Israeli forces closed the wall gates with barbered wires, and when the demonstrators attempted to cross wall to the land behind it, the forces stopped them and so the demonstrators threw rocks at them. The Israeli soldiers fired tear gas canisters and rubber-coated bullets. As a result, a 25 year-old demonstrator sustained three bullet wounds; two in his back and one in the left thigh. Also dozens of demonstrators suffocated from tear gas inhalation. At approximately 12:00 on Friday too, dozens of Palestinian civilians and human rights activists gathered in al-Haraiek area, southeast of Hebron, for a peaceful demonstration calling for opening the route linking Hebron to it southern villages. Upon their arrival to the steel gate while closes the road to bypass road (60), the Israeli forces surrounded the place and declared it a closed military zone and ordered the demonstrators to leave immediately. The soldiers fired tear gas canisters and sound bombs at the demonstration. A number of protesters passed out as a result of tear gas inhalation. Also following the Friday Prayer, dozens of Palestinian civilians and international human rights defenders organized a peaceful demonstration in the center of al-Ma’sara village, south of Bethlehem, in protest at the ongoing construction of the annexation wall. As the protestors moved towards the gate of the village, the Israeli forces closed it to prevent the demonstration from gaining access to the confiscated land and attacked the participants with shields, feet, hands and threw sound bombs and tear gas canisters at them; as a result, some demonstrators suffered from tear gas inhalation and others sustained bruises. At approximately 12:15 on Friday, dozens of Palestinian civilians and international human rights defenders organized a peaceful demonstration in the center of Kufor Kadoum village, northeast of Qalqilya, in protest to the continuous closure of the eastern entrance of the village since the outbreak of al-Aqsa Intifada. The demonstrators moved towards the entrance of the village. Immediately, Israeli forces, stationed in the surroundings of the steel gate established at the entrance, fired tear gas canisters and sound bombs at the demonstrators. As a result, Bashar Mahmoud Nazzal Saleh, 33, a cameraman for Palestine Satellite Channel (PSC), was hit with a tear gas canister to his left shoulder while videotaping the demonstration and a 14-year old was hit with a tear gas canister in the right foot. At approximately 14:30 on Friday, 08 February 2013, a group of Palestinian youngsters gathered near al-Jalama checkpoint, separating Jenin from Israel, northeast of Jenin. They started throwing stones and empty bottles and burnt car tires at the soldiers who were stationed at the checkpoint. The soldiers in response closed the checkpoint, chased the boys and fired tear gas canisters and sound bombs at them. As a result, some of them suffered from tear gas inhalation. The Israeli forces have continued settlement activities in the West Bank, and Israeli settlers have continued to attack Palestinian civilians and property. 4 houses, 3 tents, a barn, a water well and a grocery shop were demolished. The Israeli government approved the construction of 436 settlement units in the West Bank’s settlements. On 07 February 2013, Israeli forces completely demolished an uninhabited house in al-Khas village near Bethlehem. The house is located in area B, which falls under Palestinian jurisdiction under the Oslo Accords, and he has a construction permit from the Ministry of Local Government in Bethlehem. On the same day, the Israeli forces launched a wide scale bulldozing campaign in lands belonging to Palestinian civilians in Kufor Sour and Kufor Jamal villages, located near ‘Salit’ settlement, which stands on Palestinian lands, west of Kufor Sour village south of Tulkarm. According to eyewitnesses’ testimonies to a PCHR fieldworker, the Israeli forces started the bulldozing campaign for expansion projects in ‘Salit’ settlement. On 07 February 2013, a group of settlers, protected by the Israeli forces and military vehicles, raided al-Hadffira area, near ‘Arraba village southwest of Jenin. The settlers preformed religious rituals near an archeological site and stayed there for a while. On 08 February 2012, Israeli forces, accompanied by military vehicles and waste water bumping vehicle in al-Tabban area, east of Yatta, south of Hebron, attacked a group of Palestinians and international human rights activists after they built three tents on a confiscated land in the area for the construction of Kan’an village there. The Israeli soldiers cordoned the area, assaulted the participants, tried to arrest some of them and demolished and confiscated the tents. On 08 February 2013, dozens of settlers from ‘Kiryart Arba’ settlement, established on Palestinian civilians’ lands, southeast of Hebron, raided the farmlands and water spring in Kannar area to the east of Doura, southwest of Hebron. On 09 February 2013, Israeli forces, accompanied by a number of military vehicles and bulldozers, demolished an 85-square-meter, under-construction house under pretext of not obtaining a construction permit. On 09 February 2013, Israeli forces banned Ali ‘Eid ‘Awad, 50, from working in his land in Khelat al-Kutla area, adjacent to ‘Kermi Tsour’ settlement, established on the lands of Palestinian civilians south of Beit Ummar village, north of Hebron and forced him to leave at gunpoint, after registering his name and the time he entered his land. On the same day, 09 February 2013, a group of settlers raided the eastern parts of ‘Azzoun village, east of Qalqilya. The settlers threw rocks at a number of houses. The settlers withdrew later after the Israeli forces intervened. Later on the same day, the settlers attacked the aforementioned village again. They entered the village from the north in a number of busses. Immediately afterwards, they attacked the houses by the northern entrance of the village, screaming and throwing rocks. On 11 February 2013, Israeli forces, demolished a caravan belonging to Mohammed Badawi al-Tamizi (50). It should be mentioned that the Office for the Coordination of Humanitarian Affairs (OCHA) had donated the caravan to the aforementioned civilian after the Israeli forces demolished his house in 2012. On the same day, the Israeli forces demolished a house of 70 square meters, a water well and a barracks of 220 square metersin al-Sa’ida area, southwest of ‘Awwa village, southwest of Hebron. On the same day, the Israeli government decided to build 90 housing units in ‘Beit Eil’ settlement, northeast of Ramallah. According to Channel (10)’s website, the Israeli Minister of Defense, Ehud Barak, signed permits for constructing 90 new housing units in ‘Beit Eil’ settlement, under the signed agreement between the settlers and the government to evacuate ‘Albona’ settlement, which comes as part of the hundreds of settlement units that the Israeli government committed to build for the settlers in order to evacuate the aforementioned settlement. In a related context, the Israeli Ministry of Defense affirmed that the government had requested designs for 346 new settlement units to be built in settlements in the West Bank. The ministry said in a press release that it allowed the drafting of the designs for 200 settlement units in ‘Tekoa’ settlement and 146 in ‘Nacodam’ settlement, in the southern of the West Bank. On 12 February 2013, Israeli forces demolished a grocery shop of 12 square meters in ‘Arab al-Ramadeen village, south of Hebron. Due to the number and severity of Israeli human rights violations this week, the PCHR made several recommendations to the international community. Among these were a recommendation that the European Union activate Article 2 of the Euro-Israel Association Agreement, which provides that Israel must respect human rights as a precondition for economic cooperation between the EU states and Israel. PCHR further calls upon the EU states to prohibit import of goods produced in illegal Israeli settlements in the Occupied Palestinian Territories.